Syringa vulgaris ‘Andenken an Ludwig Spaeth’ An old cultivar developed in 1883, this is still one of the best purples available. Its panicle-like thyrses of single, red-purple flowers are produced late May to early June. Rarely to never fed on by Japanese beetles. Syringa x hyacinthiflora ‘Pocahontas’ Deep maroon-purple buds open to fragrant, deep violet blooms early-to-mid May. A profuse bloomer, covering plant with purple blossoms in spring. Syringa patula ‘Miss Kim’ This hardy lilac from Korea has purple buds that open to single, fragrant, pale lilac flowers when other lilacs have finished later in May. 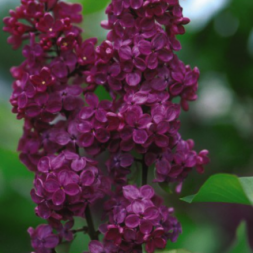 Also known as Syringa velutina, it has leaves larger than S. meyeri and S. microphylla and beautiful burgundy-red fall color. Syringa x prestoniae ‘Donald Wyman’ Panicles of purple buds opening to single, red-purple flowers. Blooms early to mid-June on large pyramidal spikes. Blooms two weeks later than common lilac. Excellent specimen or hedge plant. This entry was posted in Flowering Shrubs, Pollinator Plants, Spring, Spring Color. Bookmark the permalink.